Jerry Buchanan founded Majestic Tile Company in April 1960. In 1981, he opened the showroom currently located at 1308 Bellevue Street in Green Bay. 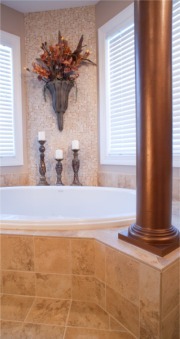 Expanded in 2010, Majestic Tile’s showroom offers full service from selection, to design, to installation. For the do-it-yourself (DIY) customer, Majestic Tile will work through your tile selection and provide the means to assist you through your installation project. Jerry’s children, Tim, Kim, and Todd, now run the family business. Many say it, but we mean it: Customer satisfaction is our number one priority. This is evident when you consider that a large portion of our business comes from repeat customers, and their children as well. Being a small business, our Majestic Tile family also includes the members of our installation crew who have been a part of the business for many years. In addition to unyielding attention to the details with each and every customer, we have built up our reputation by maintaining uncompromising quality standards in our installations.